Above: From Chimayó to Hatch, growers say it’s in the soil—and the seed. ASK A NEW MEXICAN for their favorite chile and Hatch will often get the nod. But others swear by Socorro or Chimayó or the pods from their own backyards. Raised from seed, pounded by the sun, and nurtured with fresh water from the Río Grande, can hot peppers really taste so different depending on where they’re grown? It just may be so. Professor Paul W. Bosland, aka “The Chile Man,” leads the chile-breeding and genetics-research program at New Mexico State University. He says the phenomenon of “terroir” may apply to chile just as it does to grapes. Environmental factors—soil nutrients, topography, climate, and sunshine—affect how crops grow and may impart a characteristic taste. Terroir is so specific that farmers a valley apart from each other can grow distinct crops. That marvel heightens over time as seeds from plants thriving in particular conditions are harvested and replanted, resulting in what botanists call a geographically specific landrace. But how can we describe the differences in the flavors of chile, the ingredient that practically defines our state? There’s not even a Spanish word for terroir! Chile researchers—yes, that’s a job; and, yes, you can be jealous that it’s not yours—have yet to pinpoint how natural features affect taste, but anecdotally, taste-testers say chile from different regions can be smokier, fruitier, or earthier. Comparing chile flavors is all the more difficult, because there’s not just one type of chile. Even “Hatch chile” describes only where it’s grown, not the specific variety. Bosland recommends shopping for chile as you do for wine. “Ask for varietal names, the way you’d ask for a merlot or a chardonnay. That way, you get the heat level and the flavors that you, as an individual, like,” he says. And knowing which one you might like calls for a history lesson. Just as early Spanish settlers imported the state’s first wine grapes, they tucked chile seeds into satchels and carted them north from Mesoamerica during Don Juan de Oñate’s 1598 expedition, or perhaps even a bit earlier, with the 1582–83 scouting expedition of Antonio Espejo. Once the humble pepper arrived, settlers and indigenous dwellers cultivated it vigorously. Soon the story turns into a tale of two chiles. The first chile, a long, green fruit that blushed red each fall, was grown with such dedication—and isolation—that a distinct landrace bloomed. Today, the Chimayó chile has been grown in that northern New Mexico village for hundreds of years by families who pass seeds down as they do the land it’s farmed on. For it to be labeled Chimayó chile, the seeds must be both from and grown in the village. Gloria Trujillo’s family has farmed for at least five generations, and the seeds she grows under the umbrella of Vigil’s Chimayó Produce have been passed on just as long. Today’s Chimayó chile is smaller than other varieties, thin-skinned, with a lot of seeds. It’s medium-hot and flavorful—made even more so when Trujillo dries the reddened pods in the sun, removes the stems and seeds, roasts them, and turns them into powder. It carries a distinctive orange-red color from the sun-drying and boasts a smoky, slightly sweet flavor. Chimayó chile has become somewhat rare. Trujillo says only a handful of families grow enough to sell it at farmers’ markets. The second line of chile is an upstart compared with Chimayó’s deep heritage, but it’s the backbone of New Mexico’s green chile economy. In 1907, Fabian Garcia, a horticulturalist at what is now NMSU, began breeding chile varieties to create one with a reliable pod size and heat level. In 1957, researchers released New Mexico No. 6-4, which quickly became the commercial standard. Big Jim and Sandía, two prominent varieties today, followed the same family tree. NMSU often cultivated chiles with manufacturers in mind—creating big pods with thick meat that would increase yield, two qualities typical of those varieties. Sandía is slightly hotter than Big Jim. The name Big Jim refers to Jim Lytle, who field-tested Roy Nakayama’s lab creation in the 1970s. Today, his son Jimmy and Jimmy’s wife, Jo, own Hatch Chile Express, where they continue to fine-tune local varieties. Lytle has reworked his father’s namesake chile to create Big Jim Legacy, a higher-producing chile with a straighter pod; the Lumbre, with a smaller, 5–7-inch pod that’s not as meaty as the Big Jim and tastes much hotter; and Ms. Junie, which has the kind of large pod and strong heat that make it perfect for chiles rellenos. In the Middle Río Grande Valley, Big Jim and Sandía have been blended to create a new heritage variety at Armijo Farm, a certified organic grower in Sabinal, off I-25 between Los Lunas and Socorro. Ken Armijo’s father planted both varieties, which cross-pollinated, inventing a chile that Ken calls, simply, Sabinal—reflecting the distinct place he’s cultivated it in since taking over the family farm in 1981. Sabinal is neither too hot nor too mild, whether red or green, and Armijo’s customers describe it as having an earthy flavor. “There’s not one chile for everybody,” Bosland says. “It’s time to become a little more discerning when choosing chile.” The good news is that the only way to find out which varieties you like is by taste-testing. Can you suss out the effects of the long hot days or the sweetness of the fine valley soil? Can you taste the … tierra? 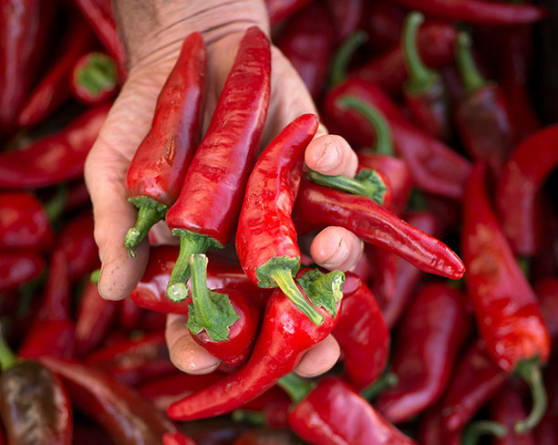 New Mexico growers suggest that adventurous eaters try these recipes with chiles from different regions to see which ones they most prefer. If you want to dress up this hearty stew from Hatch Chile Express, offer bowls of grated cheese, chopped green onions, lime wedges, and tortillas or cornbread along with it. In a large saucepan, warm vegetable oil over medium heat. Add beef, pork, and onions. Sauté until meat has browned and onions are tender. Add 4 cups water and potatoes. Cook over medium heat, stirring occasionally for 25 minutes or until potatoes are tender. Add remaining ingredients. Reduce heat and simmer 15 minutes. Adjust salt to taste, and serve. The Scoville scale rates the heat level of chile. Bell peppers rank at zero, while habaneros and Scotch bonnets range from 100,000 to 350,000 units. (A Carolina reaper tops the scale, at a coma-inducing 2.4 million.) New Mexico chiles fall lower on the heat scale, because our cuisine calls for flavor, not just incendiary capacity. The Big Jim, for example, hits 2,000–2,500. NMSU’s Paul Bosland, who has also started taste-testing chiles for heat profiles, characterizes the sensation under five categories: how fast the heat sensation occurs (immediate or gradual); how fast it dissipates; where the heat is felt (tongue, back of the throat); if it’s sharp vs. flat (does it tingle? ); and the overall heat level (mild, medium, or hot). In general, New Mexico chile comes on semi-rapidly, dissipates at a medium rate, hits the mid-palate, and has a flat heat. Heat levels depend on the specific variety.